I had a large (two gallon) bag of plums rolling around in my freezer from last summer (thanks to my neighbor). I used part of it to make Plum Preserves with Honey and Cardamom, and some in a plum crumble, but there were still quite a few plums left. 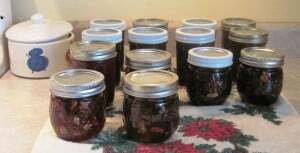 While my friend, Julie, was visiting last week, I decided to whip up a couple of batches of a plum conserve recipe that she really likes. Pit plums; do not peel. Grind or finely chop. Measure 5 cups into a 6- or 8- quart saucepot. Stir in walnuts, lemon peel and juice. Prepare jars (wash, inspect rims, sterilize in boiling water or dishwasher). Keep lids hot until ready to fill jars. 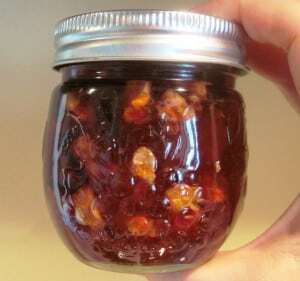 Ladle quickly into prepared jars, filling to within 1/8 inch of tope. Wipe jar rims and threads. Cover with two piece lids. Screw bands tightly. Invert jars 5 minutes, then turn upright, or follow water bath method recommended by the USDA. After jars are cool, check seals. Makes about 8 (1 cup) jars. 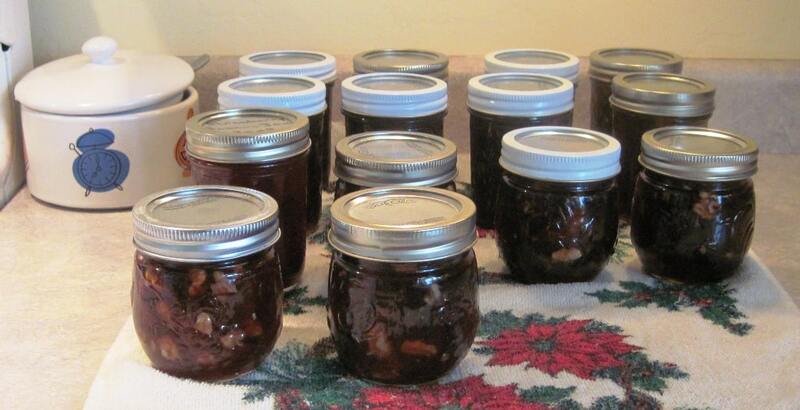 My batches made seven jars each this time around, probably because the plums were frozen. Like most fruits, plums are good for you and the health benefits of plums are worth your attention. They are a good source of unique phytonutrients called neochlorogenic and chlorogenic acid. These substances are especially effective in neutralizing a particularly destructive oxygen radical called superoxide anion radical, and they also help prevent oxygen-based damage to fats, such as the fats that comprise a substantial portion of our brain cells or neurons, the cholesterol and triglycerides circulating in our bloodstream, or the fats that make up our cell membranes. The other health benefits of plums can be attributed to their excellent nutritional profile. Plums are good source of fiber, potassium, vitamin C, and lutein and zeaxanthin, pigments that help protect your vision. Eating three or more servings of fruit a day can lower by about one-third your risk of age-related macular degeneration, the primary cause of vision loss in older adults. As I said, this is a “treat” or gift type item, but the flavors are lovely together. I passed the recipe along to the friend with the plum trees. For an alternative that's lower in sugar, do try the plum preserves with honey and cardamom. The recipe book suggests it as a topping for ice cream or cheesecake, but I like it on toast with butter or nut butter, or mixed into yogurt. Oh Laurie!! This is RUMMY YUMMY sounding. And….I miss Facebooking with you!! P.S. I am on Heal Thyself. I friended you on it if you haven't seen that yet. And am in some of the same groups your in – that is how I found you there. Pamela, I miss seeing you on FB, too! I'm not on Heal thyself as often as I would like (TONS of great info there). Between trying to keep my blog up to date, posting on LWM and FB, I'm already spending too much time online some days. I'll try to stop in to Heal Thyself soon. Checking back in here. LWM I had not heard of before. Found your link on the side and am at it now. Looks great and what I have read so far, definitely is right up my ally! I am activated once again on FB, though I am not posting on it yet…so don't post on mine yet either. I am going to be deleting various locals whom I have gotten so totally disenchanted with for the drivel they post all the time, nothing concrete or worth engaging in and easy to get caught in. Soat some point I will get my blogs FB back up and FB book for me will probably strictly blog and a little personal. Till then..I am on here and praying my computer doesn't burn before a new used arrives of which my son is working on. I have nearly everything backed up to safe all files to transfer to new when I get it. Keep warm and cozy. We got plowed out this morning. About 10 inches snow, but the drifting was a killer and wind chill is a doozy now. Chickens are staying warm locked up in the coop with the 2 brooder lights still cranking out btu's for them. If you're on FB and are basically getting spammed by people in your newsfeed, you can block their feed by clicking in the right hand corner of their post. A drop down menu should show up. I've had to do this with some folks because I was overwhelmed by constant chatter but didn't want to unfriend them. I think we got close to two feet of snow. Haven't seen recent official totals. Drifts are around eight feet tall behind the house. We used to have lots of plums when I grew up in Sweden. This recipe sounds delicious. Jasmine – you're a sweetheart. It is very yummy. I love the little recipe booklet that this came from – it's full of unique combos. I really enjoy trying new things, but I'm not much of a shopper, so quite frequently there's an experiment or two going on in the kitchen. I recently made a raspberry hibiscus kombucha which was lovely, but I didn't write down exactly how much of what I put in the bottle – whoops! Now I have to try again until I recreate it. Hugs to you and the family. Mikki – I think evaporated cane sugar would work well with the flavor profile in the conserve. Honey would probably work, too, but would give a softer set. I would try first at the same proportions as the current recipe. If you have a low sugar pectin like Pamona's you could follow their suggestions for reducing the sugar in the recipe. about the walnuts can you use Black walnuts seeds and how do you get off the green outer soft hull. If you got them, you could certainly use them, they're just a lot of work. Made this the other day. I have two plum trees that were bending over with plums this year. Really really good recipe!! I’m probably going to use it inside a puff pastry or on top of scones. Thanks for publishing this.